Battles on the Ice társasjáték - Magyarország társasjáték keresője! A társasjáték érték! A Battles on the Ice egy remek társasjáték, 2 játékos részére, az átlagos játékidő 1 - 1.5 óra. A játékmenet erősen épít a "hex-and-counter" rendszer és a kockadobás mechanizmusokra. The third game in the Shields & Swords II series tackles two unusual engagements. In both battles, the "invincible" Livonian Order - an autonomous branch of the Teutonic Knights - met their enemies atop a frozen body of water, and in both cases, they suffered a humiliating defeat. 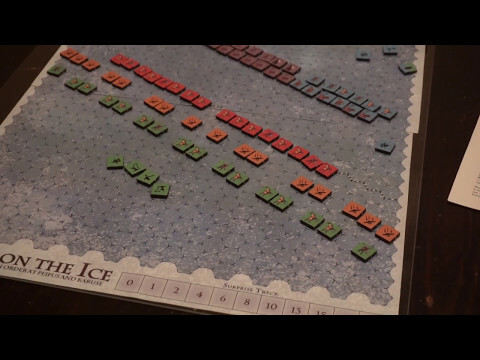 The 1242 battle at Lake Peipus was immortalized in Sergei Eisenstein's rousing film "Alexander Nevsky", and is probably the first thing most folks think of when they hear "Battle on the Ice". This battle should have been a cakewalk for the Livonians, as their elite, well-armed, ruthless cavalry were facing a feudal army of peasants. But Nevsky exhibited sound tactical judgment, and a deployment of his own cavalry at just the right time turned the tide decisively in his favor. 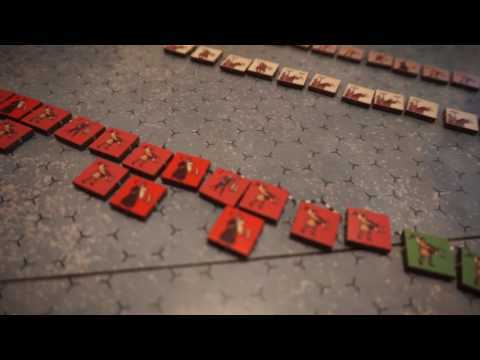 Similar to THE GRUNWALD SWORDS or S&S I game OUR ROYAL BONES, this battle allows the Novgorod Player to choose the exact moment to bring in his horse archers (making their first appearance in the S&S II series). The longer he waits, the more VP he'll score, but the greater the chance that it'll be too late. The 1270 Battle of Karuse, fought on the frozen Baltic Sea, is a bit more obscure, but quite possibly more interesting. This time around it's the Livonians and their allies against a Lithuanian Army under Grand Duke Traidenis. The Lithuanians use sleds as a defensive barrier, and use hit-and-run tactics to unhorse the bold brothers. Special rules for unhorsing, dismounting, and charging the sleds give this one a lot of nuance. Both battles see a force that's strong in cavalry brought low by a force that's predominantly fighting on foot. Semi-random force pools utilized in each battle provide additional replayability. As always, the core S&S II system - easy to learn, teach, and play - allows for a fun, fast, streamlined medieval experience.